I LOST 2.5LBS ON TUESDAY!! Phew! Got it out of my system!! Obviously I am CHUFFED and it’s spurred me on so much to carry on Food Optimising and get to a weight I’m happy with. Yay! Ben also lost a fantastic 2lbs, meaning he’s already lost over half a stone! It’s only been 2 weeks! 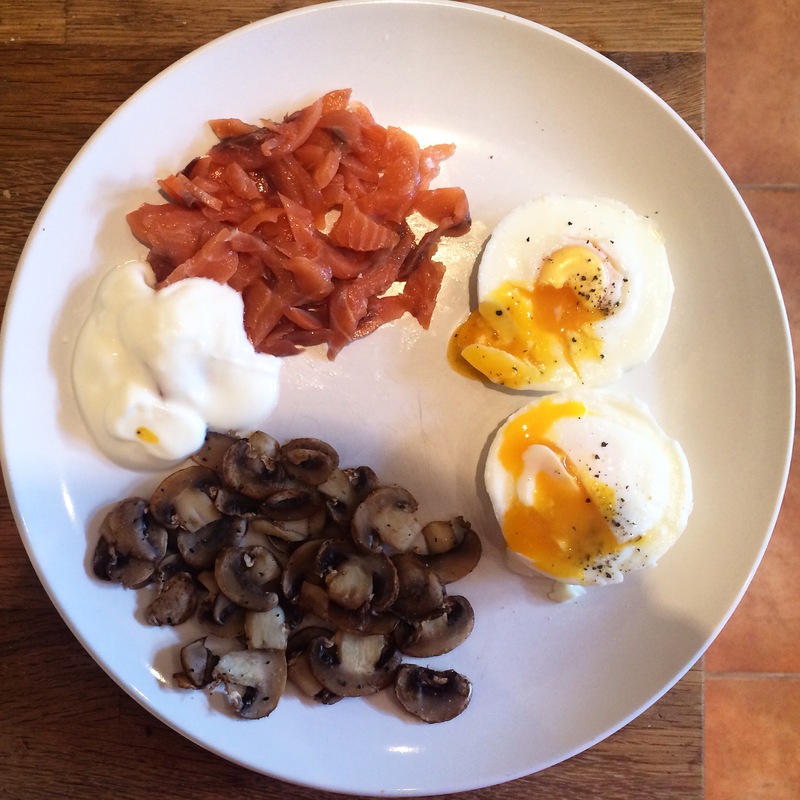 Blimey, the boy can diet. I’m feeling so lucky to have a lovely group with a fab consultant; I enjoyed listening to everyones thoughts about the week they’d had. I even felt a bit emotional at times when people were saying how they’d struggled, how much they want it, etc. It’s also so inspirational; some members have lost SO much weight it’s insane! I don’t have a crazy amount to lose but hearing members saying they’ve lost 2/5/8 stone (!) just makes you think if they can do it, I can do it! Or I should be able to!! 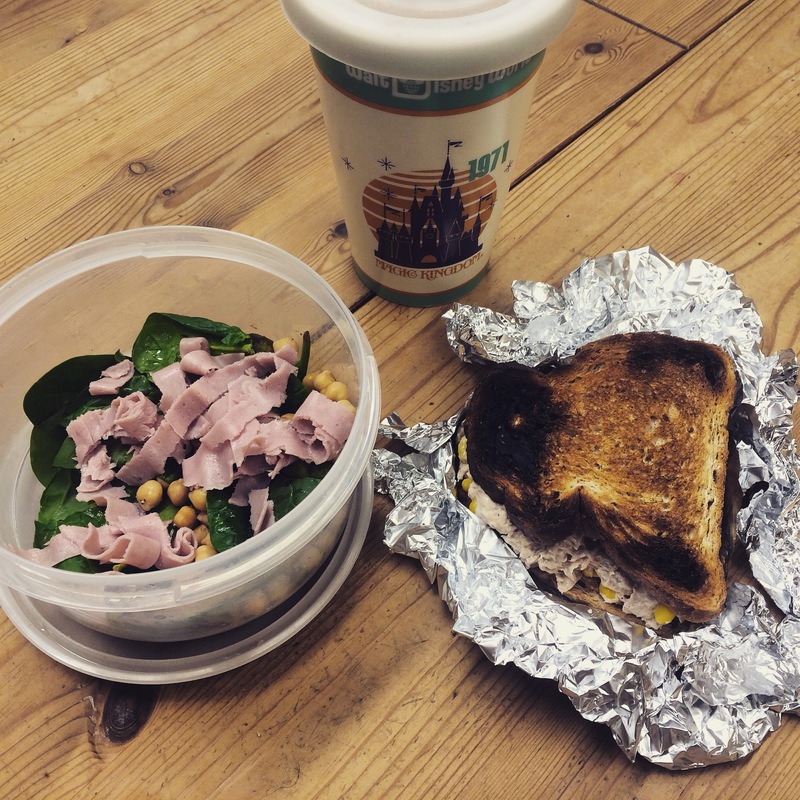 So, a recap of this weeks eats! Apologies for the slightly late post this week, we’ve gone into the following weeks eats too, eek! It’s been another week of lovely food. I cut back a bit on non-speed fruit and veg, and added in speed where I could. Breakfasts have been my HEXB of porridge oats, made with water and splenda and topped with 1/2 banana. I find this fills me up till lunch at 1 which is brilliant! I experimented with yogurt, HEXB of All-bran and yogurt a couple of mornings but I just don’t find it as filling, or yummy! So porridge is my go-to weekday breakfast. 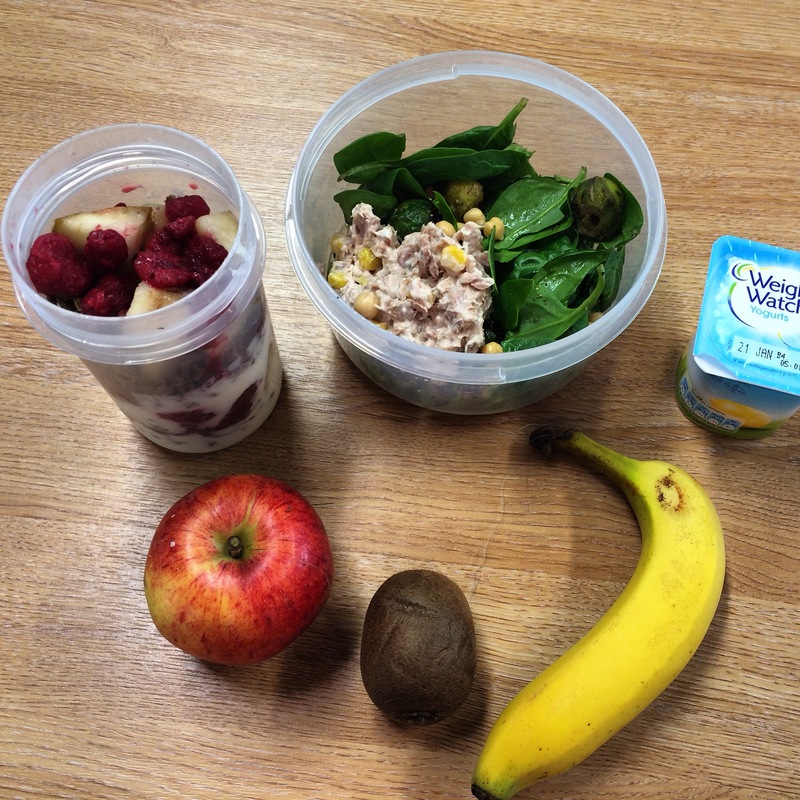 An example of the food I generally take to work each day. I often don’t end up eating the fruit as the rest is filling enough! Breakfast this day was layered All-Bran, yogurt, raspberries and apples. 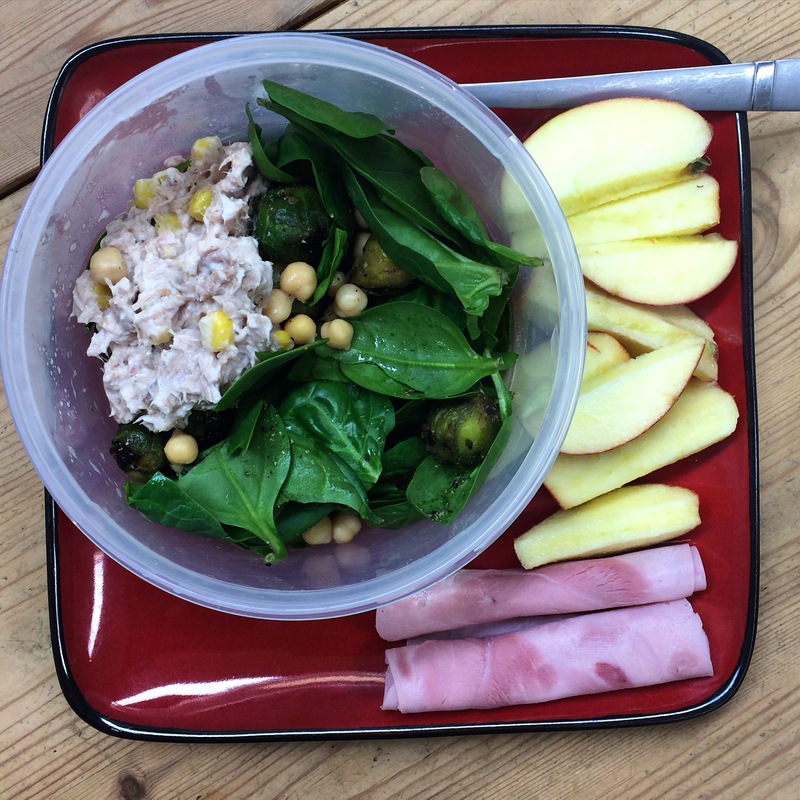 Tuna and sweetcorn with extra light mayo, chickpeas, spinach, apple and ham slices. Lunch on a weekend, way more exciting! A bunch of random leftovers piled on top of spinach. Surprisingly good! Dinners have been a lot more interesting. 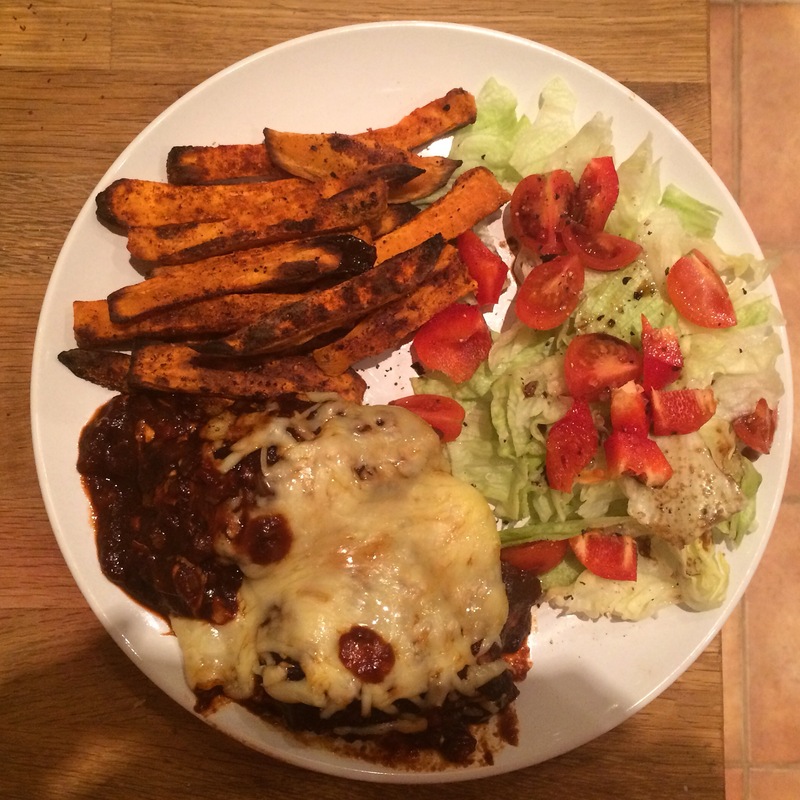 Friday night we had loaded fries…Slimming World style! We made sweet potato and normal potato fries then layered panfried peppers, onions, courgettes and Quorn beef strips, all coated with a BBQ spice mix. 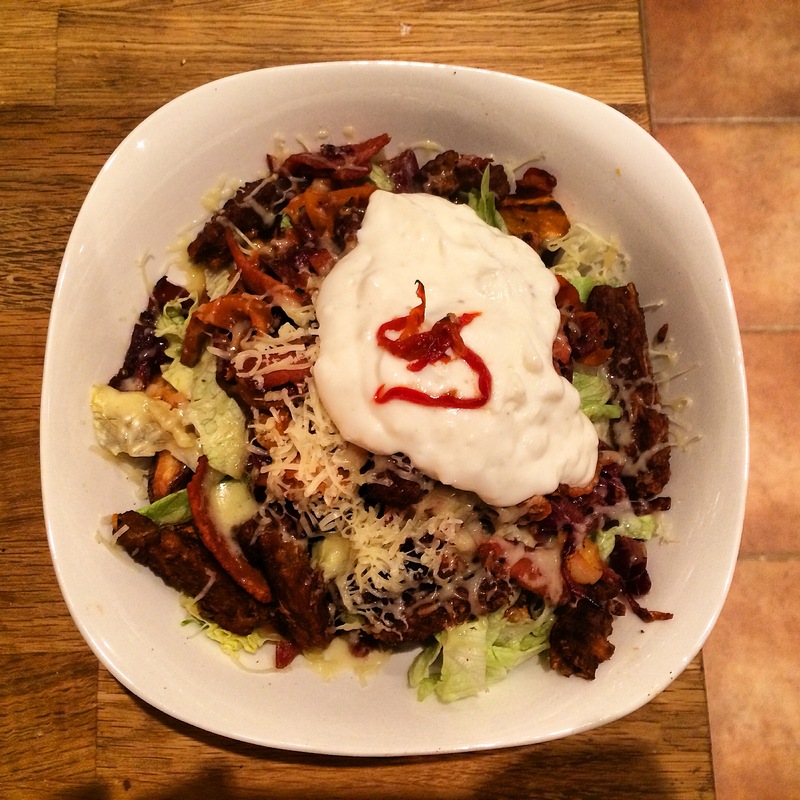 We topped the bowls with shredded lettuce, sweetcorn, our HEXA of cheese, and a dollop of fat free yogurt. SO GOOD! And a fantastic way of eating loads of speed food without really noticing. Sunday’s dinner was 5% beef mince simmered for a looooongggg time with 100ml of red wine (4 syns) and beef stock, loads of finely chopped carrots, onions, courgette and mushrooms, garlic and tomato pasta. This is my new favourite Sunday dinner and it makes looooaads! 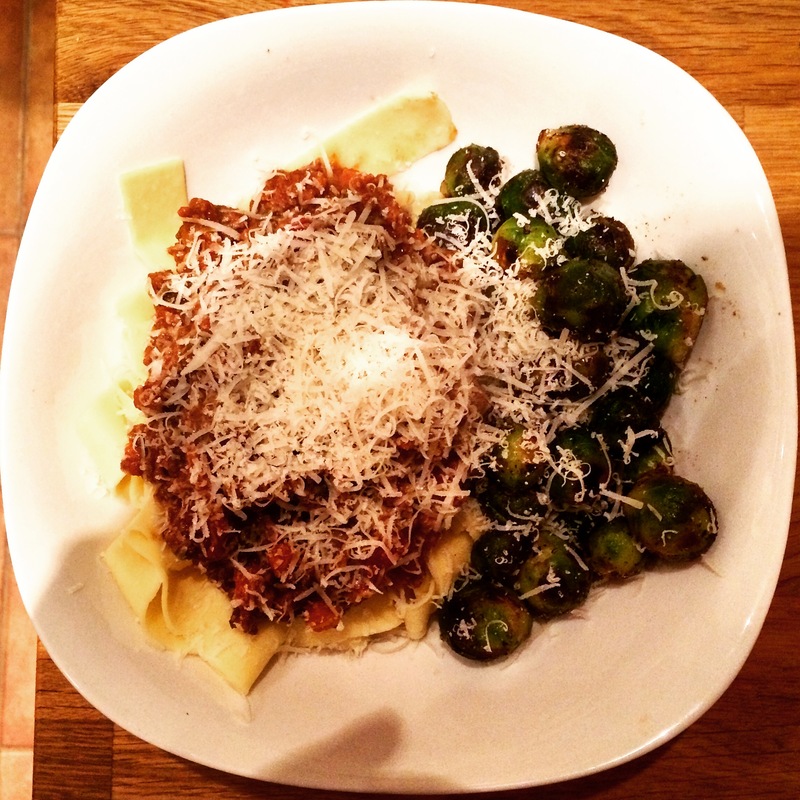 I served it over papadelle pasta with roasted brussells sprouts and my HEXA of parmesan. A proper winter warmer! I made SW hunters chicken this week! I made a BBQ sauce using tomato passata, chopped onion, garlic, sweetener and KEY INGREDIENT diet coke! I made hunters chicken on last years Slimming World attempt but I just couldn’t replicate the sweet, sticky BBQ sauce using the usual Slimming World recipes. ‘Diet cola chicken’ is a popular SW dish using similar ingredients so I chanced it and chucked some diet coke into the pan. I simmered it for a while until it reduced and went sticky, then tasted it. BBQ HEAVEN!! It was so good. I’m never making BBQ sauce without diet coke ever again. I poured the sauce over two chicken breasts I’d wrapped in bacon (fat cut off!) and then topped the lot with my HEXA of cheese. Served with roasted sweet potato fries and a simple salad, this meal was incredible. I want to make it every day! If you want some proper pub tasting food on SW, definitely give this a make. It’s about as far away from diet food as you can get! On Thursday, myself and the boy went swimming. It was a pretty big deal. We bought swimming caps (mine is for extra long hair as I have a lot of hair…) and goggles and dug out our swimsuits from the drawer they were probably shoved into after we got back from Florida in 2013. We were both weirdly nervous, but it turned out to be fine! It was relatively quiet, the pool was lovely, and we managed a full 40 minutes before it started to get a bit busier and we felt like our arms were going to fall off. We got home about 8 which wasn’t too bad and I was so proud of us! We’re going to go at least once a week from now on, and really make a concerted effort to stick at it. This is the dinner we had when we got home, which I had prepped before we left. 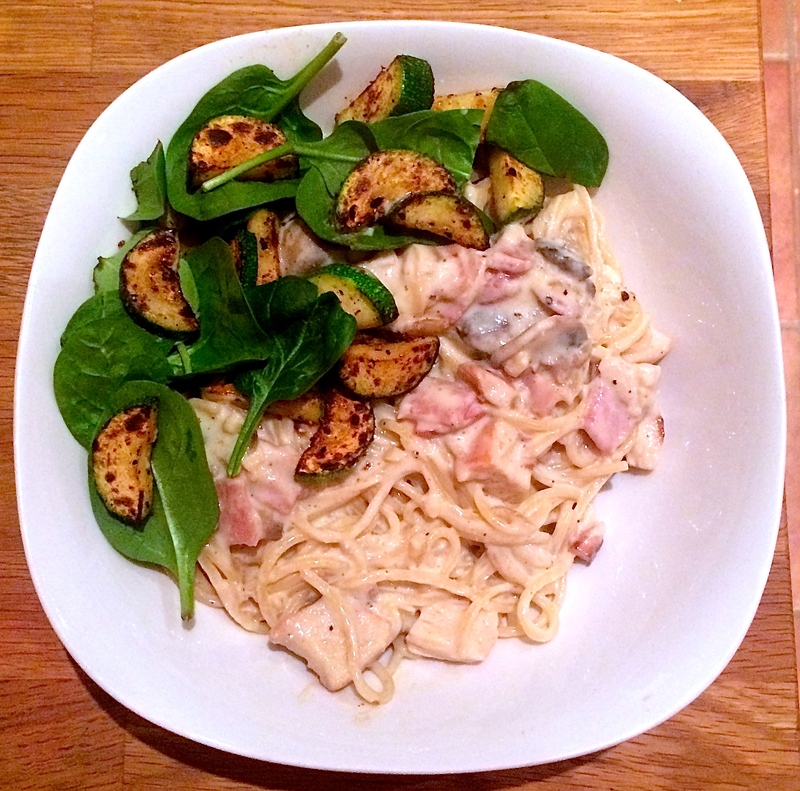 SW syn-free carbonara with courgettes and spinach. Finally, my favourite meal of the week! 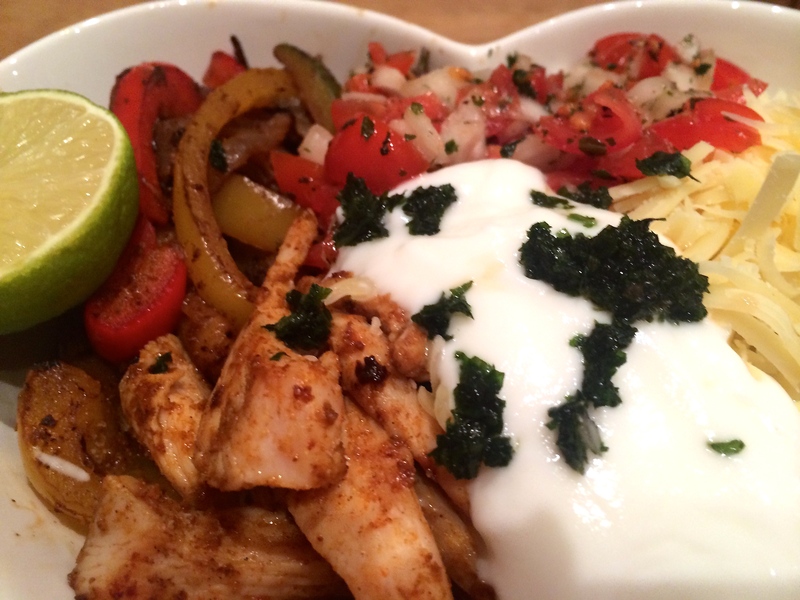 Chicken fajita bowl, mmmm! 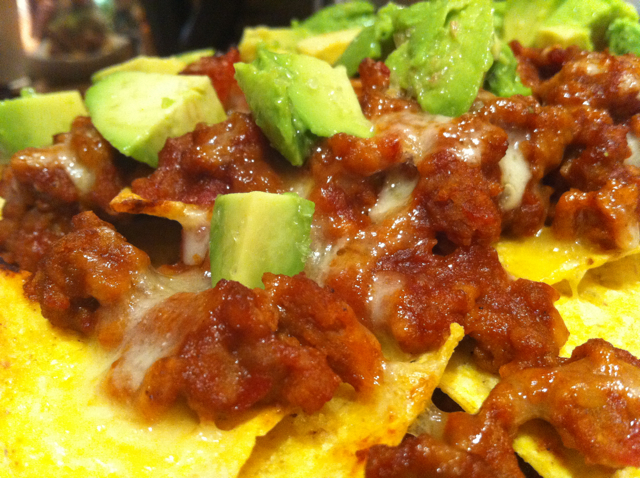 Everyone needs to make this, right now. It’s so perfectly suited to SW! I didn’t really follow a recipe but I’ll jot down what I did in case anyone fancies giving it a go. Serves 1 with a small bowl of leftovers for lunch the next day, can easily be doubled to feed 2 (or 4 etc etc) quantities are pretty flexible depending on what you have! 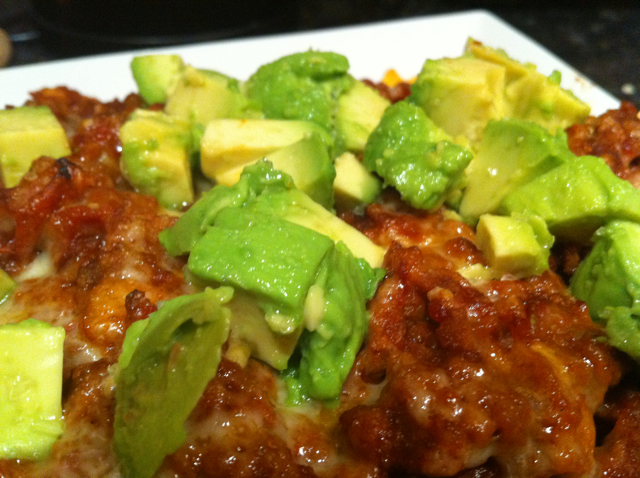 Optional: avocado, chillis, black beans, refried beans…anything else you’d normally have with fajitas! 1. Get your rice on! I used a sachet of microwaveable spicy Mexican rice which was in the cupboard, but normal white or brown rice would be fine too. The sachet is 2 syns so plain rice would be better as it’s syn-free! If you’re using plain rice, I read a lovely recipe where the cook mixed chopped coriander and lime juice into the rice which I think would be amazing! 3. 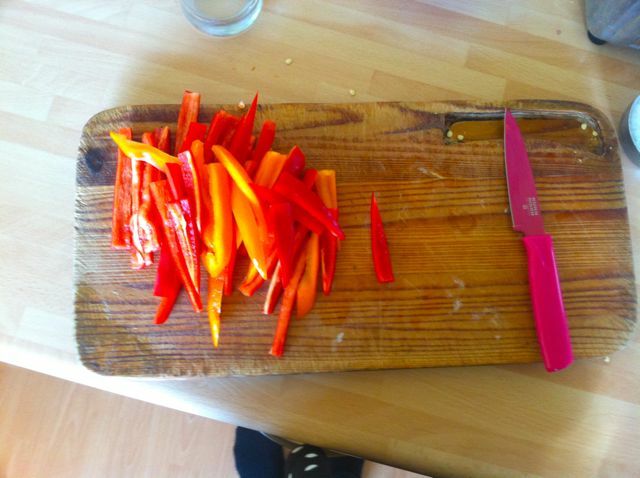 Meanwhile, slice the peppers, onion and courgette into long strips and fry slowly in a pan with Frylight. I find a slow pace reallllyy helps when you’re cooking with Frylight, it means the food doesn’t catch too quickly and cooks fully before browning. Add the fajita seasoning after the vegetables have been cooking for about 10 minutes. 4. Super quick pico de gallo time! This isn’t essential but really made such a difference to this bowl of goodness. 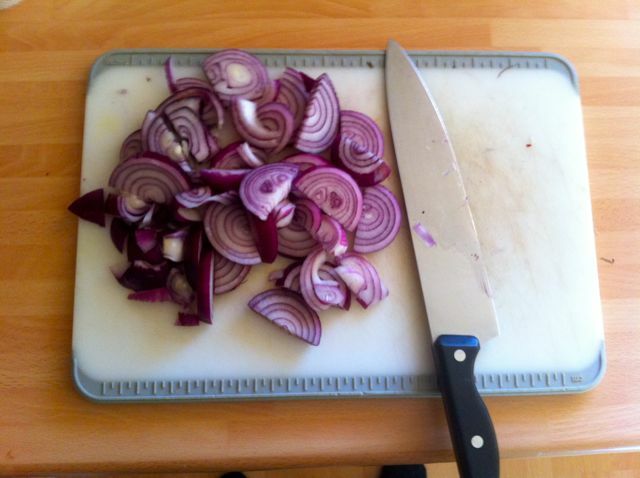 Finely chop half an onion and a handful of cherry tomatoes and season well. I didn’t have fresh coriander so I used frozen, but either would work! Sprinkle coriander over the onions and tomatoes and mix it all together. I added a sprinkle of garlic powder too, for an extra kick. Put the pico de gallo in the fridge for the flavours to combine! 5. 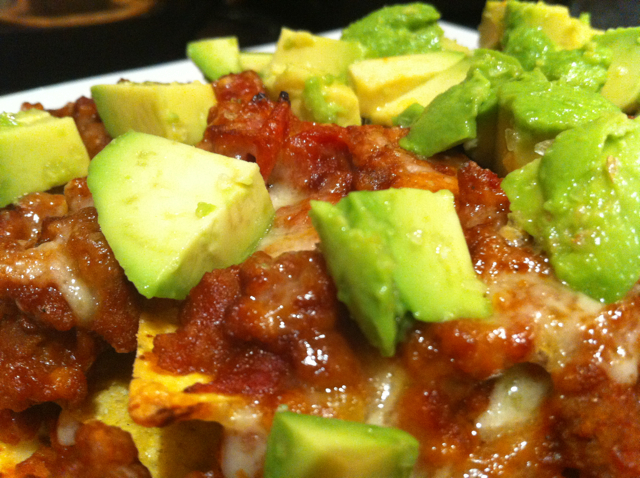 Chop lettuce, grate your HEXA of cheddar (I used reduced fat cheddar so I get 40g, score!) and cut a lime in half. 6. Get the chicken out of the oven and slice it up reaaallll good. Add your cooked rice to a bowl, and add the sliced chicken. Once the veggies are at an acceptable level of caramelised crispy-ness, pop them on top of the rice too. Add the chopped lettuce, pico de gallo and cheese, and top with a generous dollop of yogurt. Squeeze a lime all over the bowl and voila, ready to go! I feel like I’ve been posting a lot of restaurant and eating 0ut meals recently, so it’s time for a spot of home cooking! We both love Mexican food and were big fans of ‘Friday Night Fajita’s’ during our Uni years. 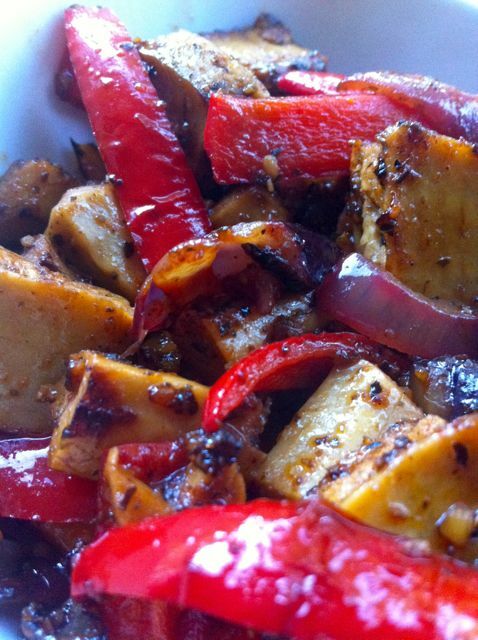 Fajita’s in particular are great because they are so versatile! You can stick with the basic version and just have the meat, peppers, onions and salsa, or go crazy and buy extra toppings like sour cream, guacamole and cheese to create deluxe fajitas. If I’m honest, I’ve never had a fajita that doesn’t involve cheese and we also always buy the extra toppings. Any chance to eat guac, I’ll take it. But if you wanted to, you really could just have what comes in the shop-bought fajita kits and they’d still be delicious. 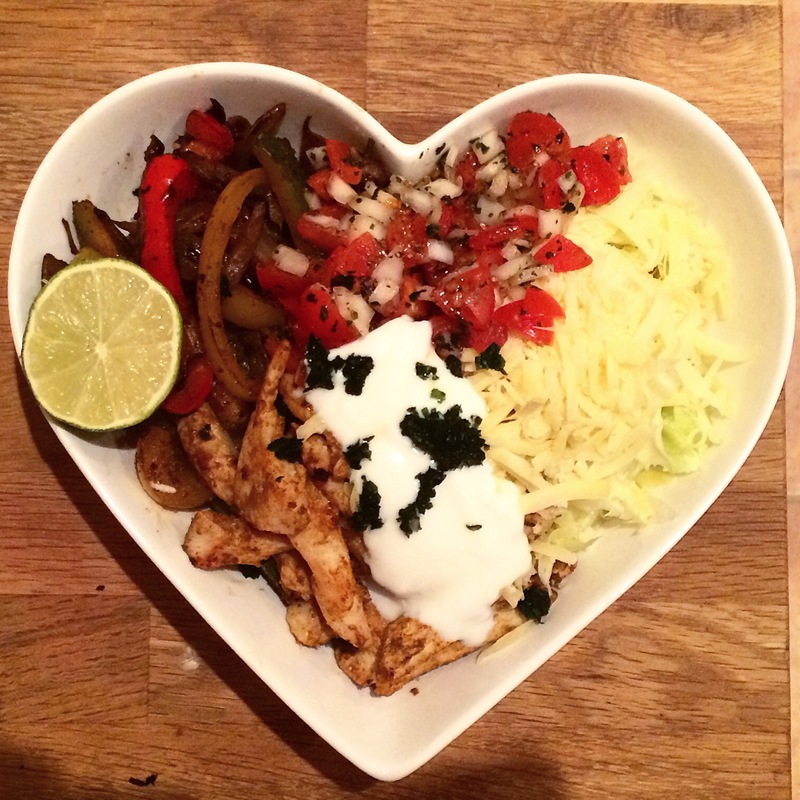 We were particularly excited for our Mexican Night because we had a new type of veggie chicken to try! We actually went to Asda specially to buy their own-brand ‘chicken style pieces.’ I’d seen them online and a memory stirred of the now retired, but never forgotten, Sainsburys own brand ‘chicken style pieces’ which were without a doubt the best fake chicken we’d ever had. They were so convincing, in fact, that I actually stopped eating them the first time we tried them, as I thought there’d been a catastrophic mix-up in the factory! Sainsburys disappointingly stopped selling them a few years ago and we’ve never quite recovered. I like Quorn pieces but they get really boring and they don’t really have any flavour. The Sainsburys ones had a seitan-like texture and a herby taste that almost didn’t need any extra seasoning. Oh, how we miss them. So, I was thrilled to see after ripping open the bag, that the Asda ones looked and smelt exactly like the Sainsburys ones! Result. I knew at that point, this Mexican Night would go down in history. Mainly because we had margaritas. Here are some of the ingredients for our feast. 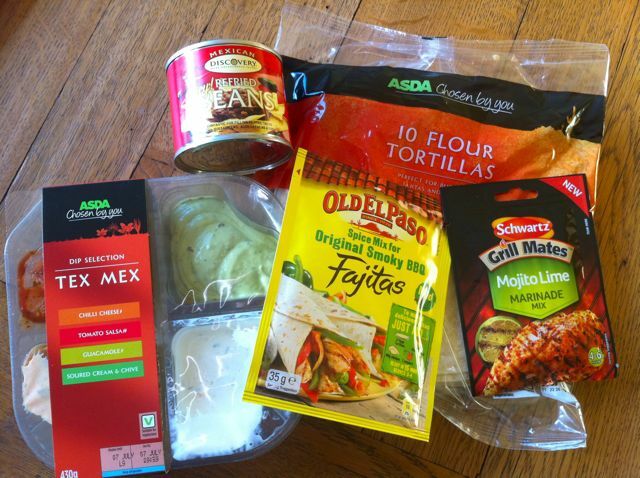 Hello Asda Mexican quad-dip!! Possibly the best £2 you can spend in life. We also had copious amounts of grated cheese, onions, peppers and of course, the ‘chicken style pieces.’ We were good to go! We started off chopping up our onions and peppers. Note the amazing hot pink knife! Purchased in TK Maxx for the princely sum of £7.99! Definately going to buy a set of coloured knifes when we move out. They just make chopping so much more enjoyable. Once we had chopped our veggies and defrosted the ‘chicken,’ we were ready to start cooking. We wanted to use different spices on our fajitas so needed two pans. Ben had chosen a ‘Mojito Lime’ sauce which smelled absolutely amazing when he put it on his chicken and I was kind of wishing I’d gone for that one too. But, I couldn’t resist my favourite “Original Smokey BBQ’ spice mix, which comes in the make-your-own fajita boxes, or you can buy separately for about 80p. Bargain! Sometimes I find the other Old El Paso fajita seasoning packet is too spicy and I just love the smokey flavour of barbecue in general. We sauteed the onions and peppers until they were cooked but still had some bite to them, before adding the chicken pieces which don’t take as long. 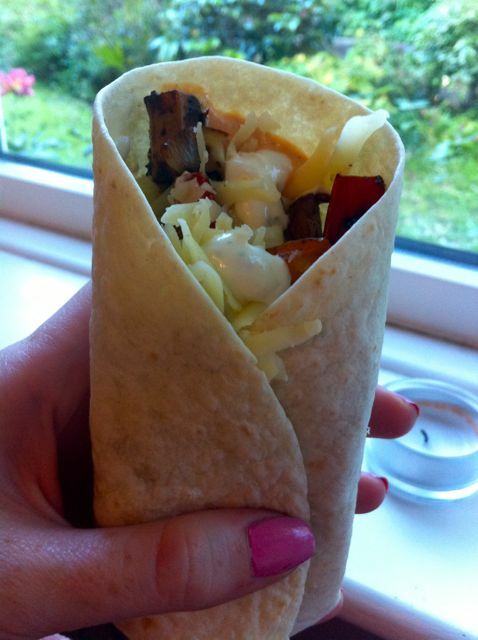 We sprinkled our respective seasonings on and voila, fajita mix! So easy and they smelled sooooo good! 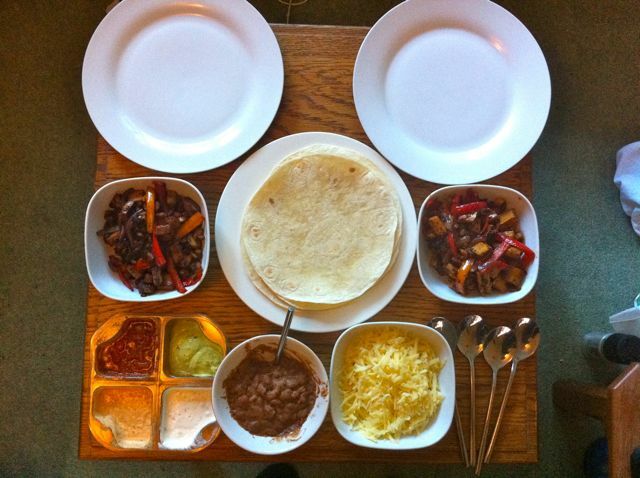 We then assembled all our items on the coffee table – you pretty much have to eat fajitas on the sofa watching Man Vs Food. Quite the spread, no? That bowl of brown mush is Ben’s refried beans. I’m not a huge fan myself but he loves them and always gets them when we have Mexican food. You can also see the quad-dip in all it’s glory from this lofty birdseye position. 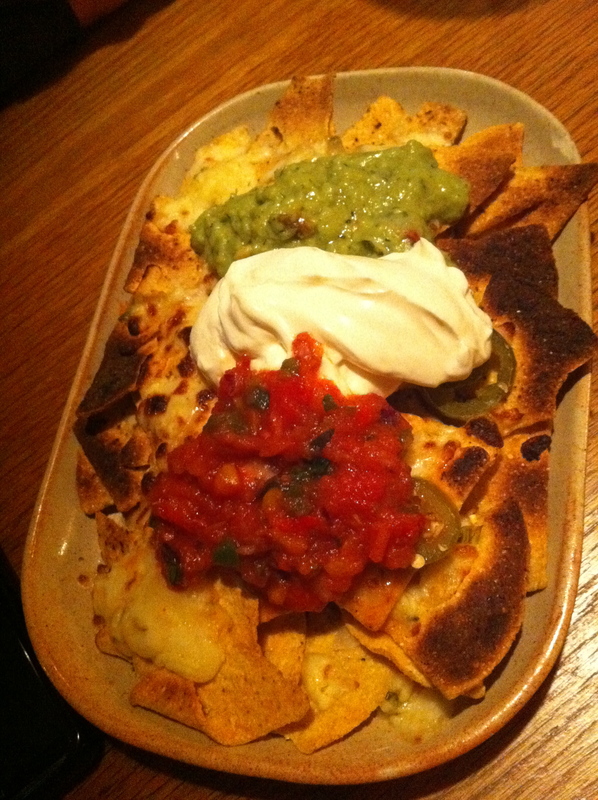 Clockwise from top right; guacamole, sour cream and chive, nacho cheese and salsa. I like to slather the guac and nacho cheese onto my fajitas before adding the toppings – they act as a kind of glue to stick the tortilla together once folded! 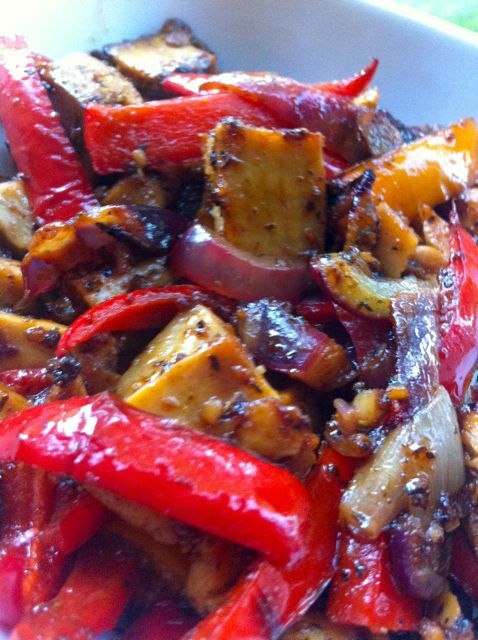 I love the colours of the peppers, onions and chicken together! The peppers were actually perfectly cooked for me, as I hate when peppers are more or less raw in fajitas. 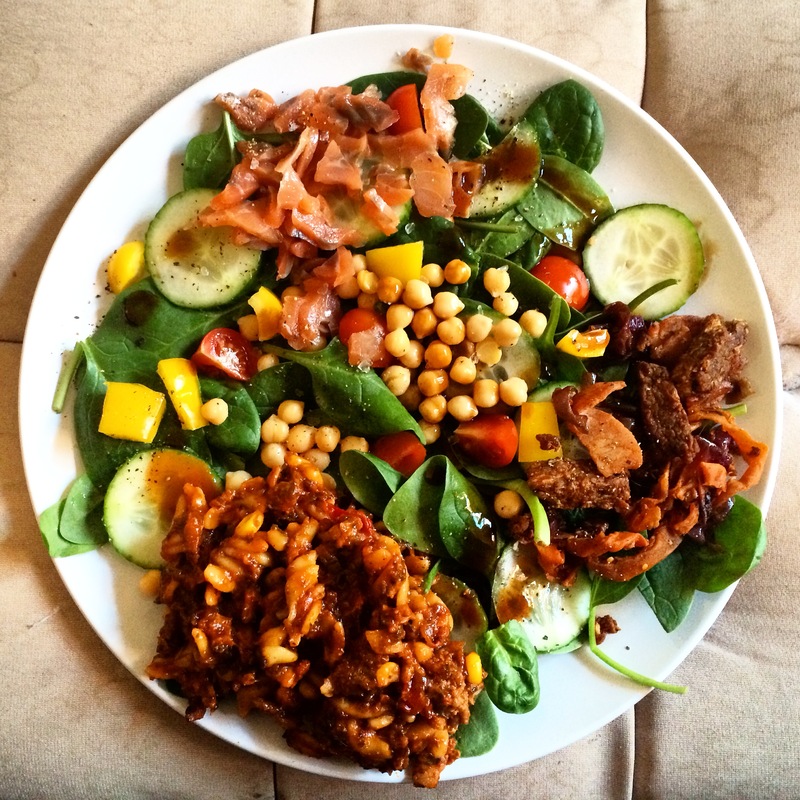 Too much crunch – it isn’t a salad, people. With all our ingredients laid out neatly, it was just a case of assemblage! I am not going to tell you how to assemble a fajita because quite frankly, you either have the skills or you do not. Ben is king of folding and recently put me onto a new technique that involves folding each side up and then rolling it length-ways, like a burrito. I prefer to fold up one end and then roll it up lengthways, so I have one open end, once closed end and a greatly reduced risk of spillage. Innards shots! Note the beautiful front garden in the background. I was trying to get some photos with natural light in what is a very dark room with only one working lightbulb. 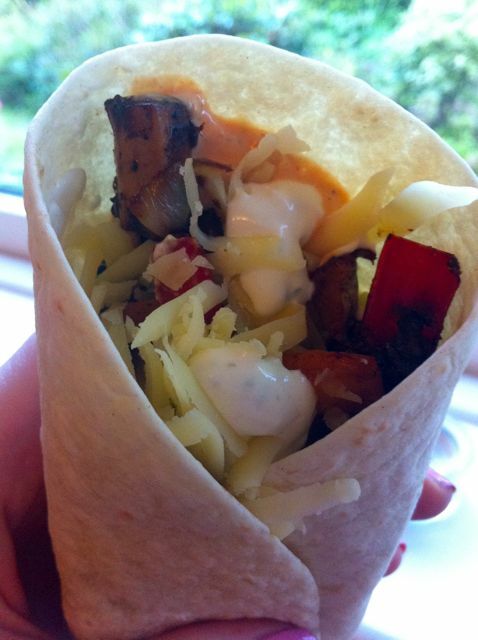 As you can see by the way the cheese and dips are literally busting to get out of the wrap, I consider toppings integral to the fajita process. In fact, I think if I only had cheese, guacamole and nacho cheese dip in a tortilla, I would still have a pretty good time. 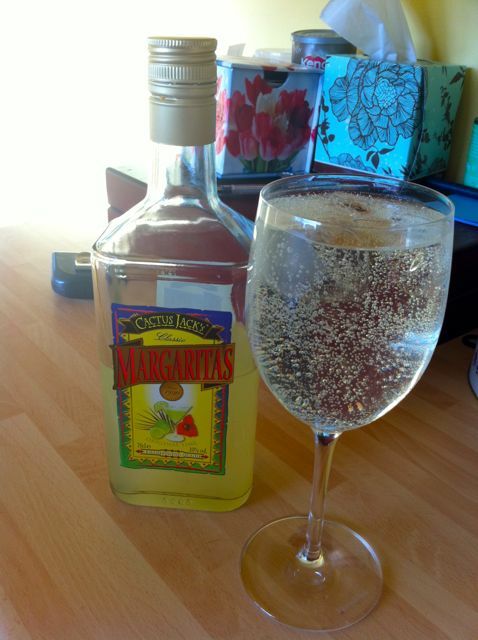 Fabulous night, seize the opportunity to make fajitas next time you happen to have the ingredients on hand. You won’t be disappointed! We had tickets to Derren Brown on Saturday at the Mayflower in Southampton and wanted to go out for dinner first. We wanted somewhere that wasn’t too expensive, having spent a lottttt of money the week before in Disneyland Paris (lots of posts coming up about DLP food!) but all the Italian etc restaurants near the Mayflower were (understandably!) pretty pricey. 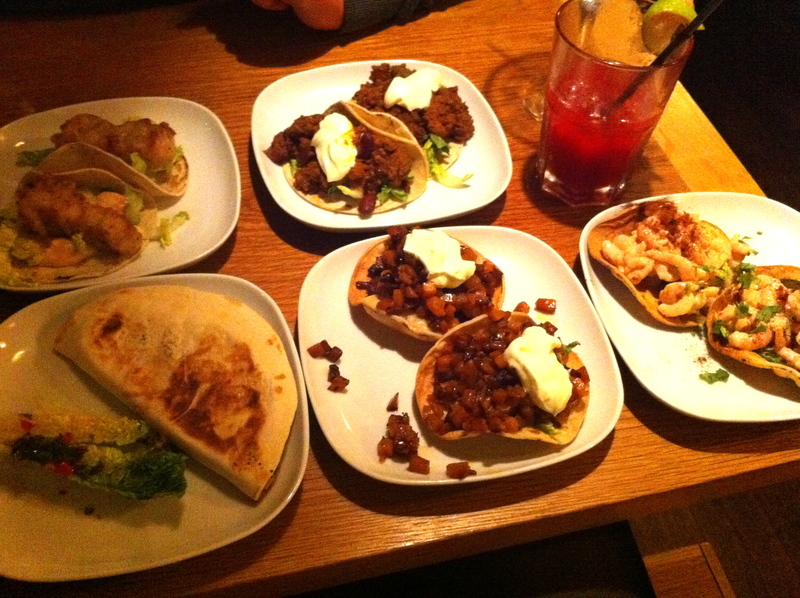 While trawling through Google I came across a Mexican restaurant that, while not cheap, sounded really nice and fun and something a bit different. They had LOADS of veggie options which was a lovely surprise, plus an extensive vegan menu! Not something you see very often at all! I had booked a table for 5.30 and when we entered the restaurant (located on Bedford Place) it was really quiet with only a few other tables occupied because it was so early. We were seated in a cute little booth-for-two near the door which I was quite happy with. We had to wait about 10 minutes to order drinks which was a bit surprising given how quiet they were but I think they were slightly understaffed – we noticed lots of new staff come in at 6pm so that must be when the busy period starts. We were in the mood for cocktails! 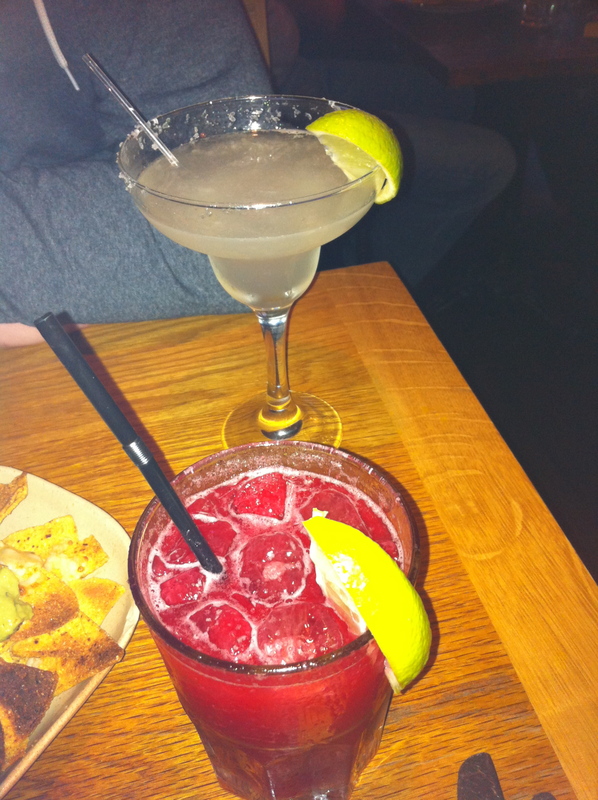 I ordered a ‘Saucy Senorita’ which was a rasberry tequilla long drink, delicious! Ben went for the standard Margarita which he really enjoyed – made a nice change from the over-priced and not very authentic Marg’s he’d been receiving in Disneyland Paris! I had seen online that the restaurant was offering a complimentary portion of nacho’s if you ‘Liked’ their Facebook page. I had ‘Liked’ it before we left but then got very confused as there was no mention of the offer or instructions anywhere on the page. But, I figured it was worth an ask! The waiter said if we could prove we’d Liked the page then we could definately get some! Cue a few frantic attempts at accessing the page on our phones with weak internet signal but it didn’t matter – he bought the nacho’s out a few minutes later and said we didn’t have to show him, he believed us! Fabulous. 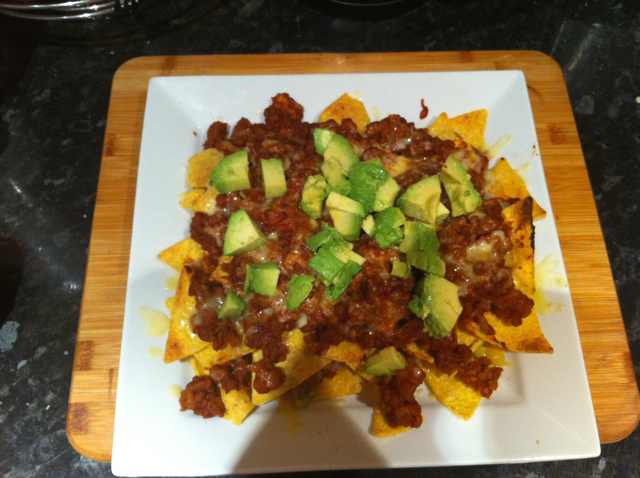 The nachos were a very generous portion and easily big enough to share even though they were a single portion! Loads of fresh guacamole and sour cream and a pleasantly spicy salsa which, coupled with the sliced jalapeno’s on top, packed a serious punch! We finished the nacho’s in no time but again had to wait a while for a waiter to return to take our main course orders. 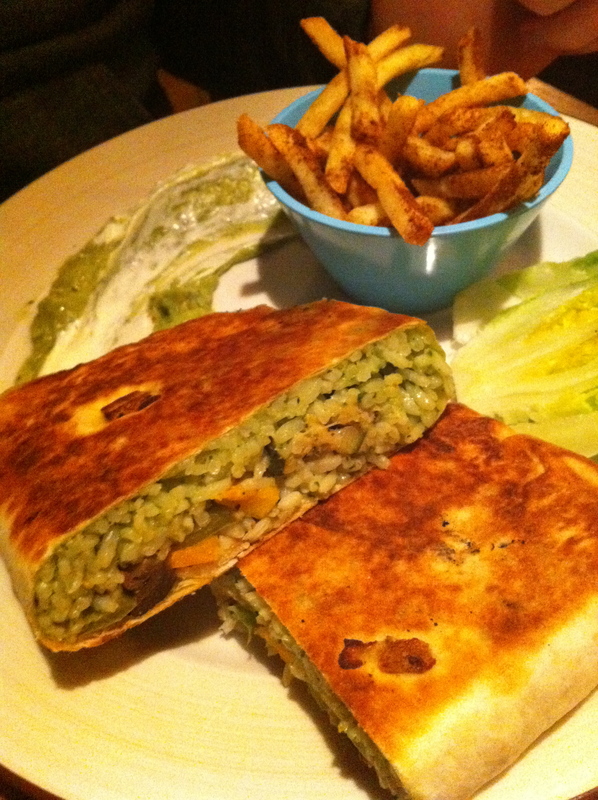 Ben went for the Fajita Vegetables Burrito which came with fajita spiced fries. He also got a side of chargrilled corn on the cob which is his absolute favourite thing ever! I had 6 dishes. 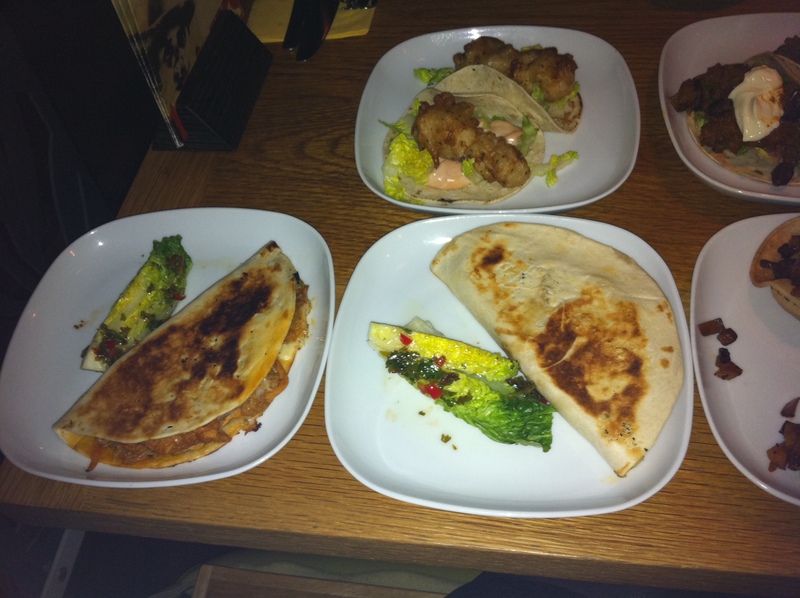 My favourite’s were the two quesadillas – ‘Yuccatan’ pork which was gorgeous, smokey BBQ pulled pork with cheese, mmm! I also got the Chorizo and Potato with roasted thyme. Both lovely but they didn’t photograph well! 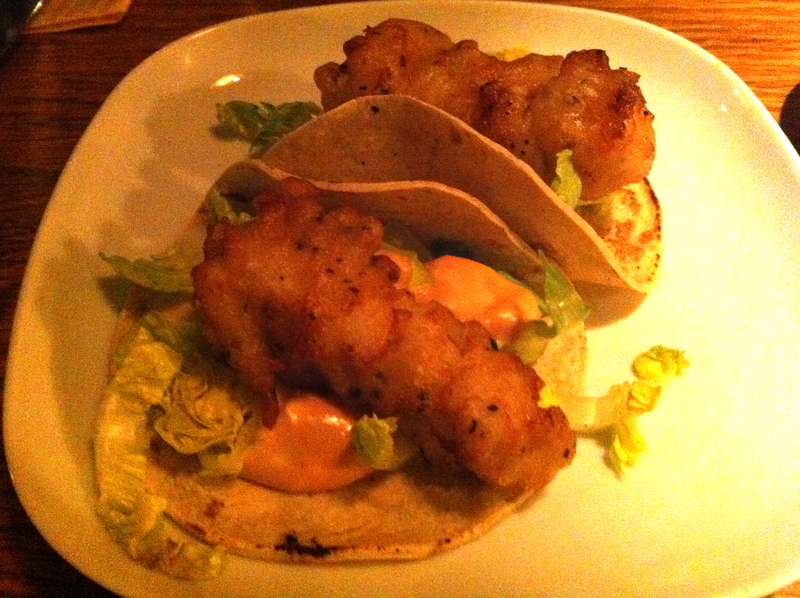 I also really enjoyed the fish soft tacos with chiptle mayo. I’ve been wanting to try fish tacos since I saw them on a show about street food on Food Network and they were as delicious as I imagined they’d be! Lovely soft beer-battered cod pieces, crisp iceberg lettuce and a generous slather of the chipotle mayo. Unfortunately the othe 3 dishes weren’t quite so stellar. 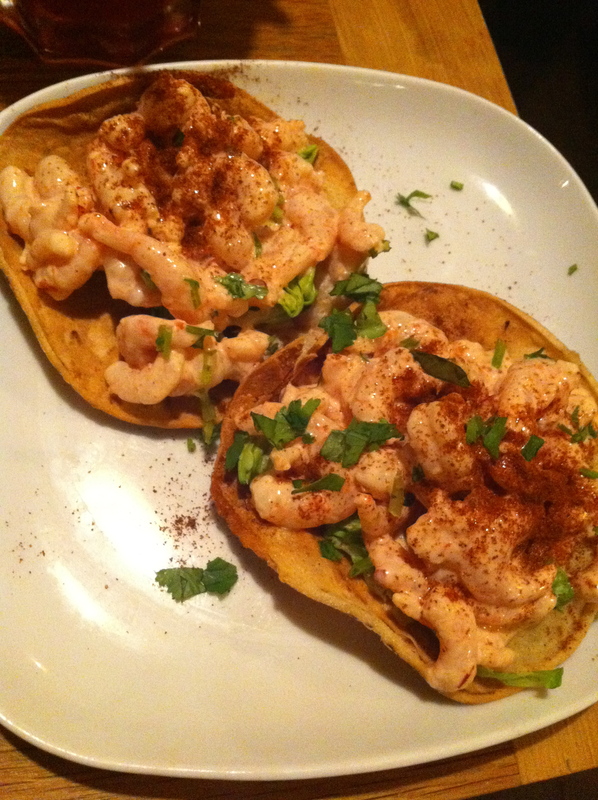 The chipotle prawn tostadas were VERY odd – they were tiny cold prawns in a marie rose sauce! The sauce was flavourless and I left most of this dish. I think I expected battered king prawns, a bit like the fish tacos, so to receive a souped up prawn cocktail was a bit of a shock! The next dish was unfortunately so spicy I couldn’t eat it. 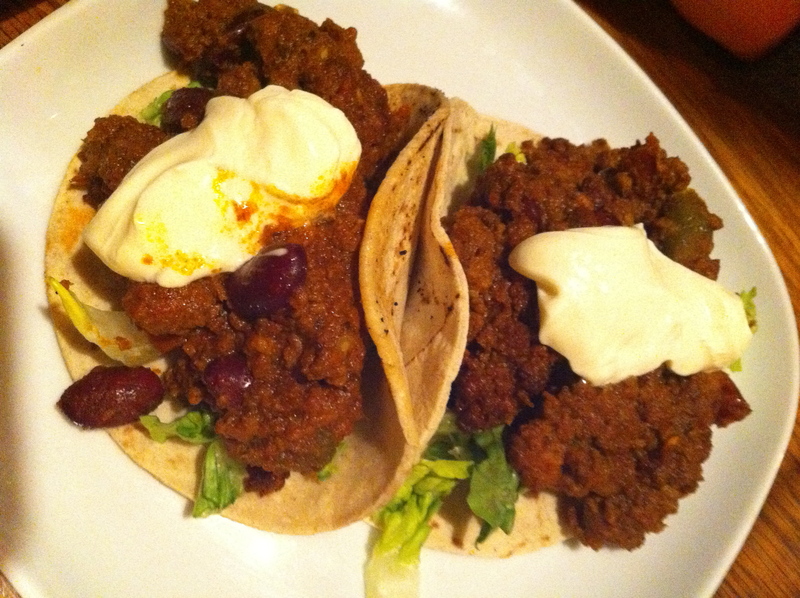 These are the beef mole chilli soft taco’s. They had a nice smokey flavour but there was way too much jalapeno in the chilli. Finally, I had the ‘Ancho’ squash tostadas – ordered mainly for Ben’s benefit as they are a vegetarian dish of roasted butternut squash, dried chilli and baby spinach. They sounded lovely…but they were tasteless! Ben took one bite and returned to his burrito and I ate half of one before admitting defeat. Unfortunately the butternut squash just tasted of oil with no discernable flavour. So overall, 3 out of 6 I loved! The chilli was unfortunate as I have a low tolerance for spice and as I said, it did have a nice smokey flavour. 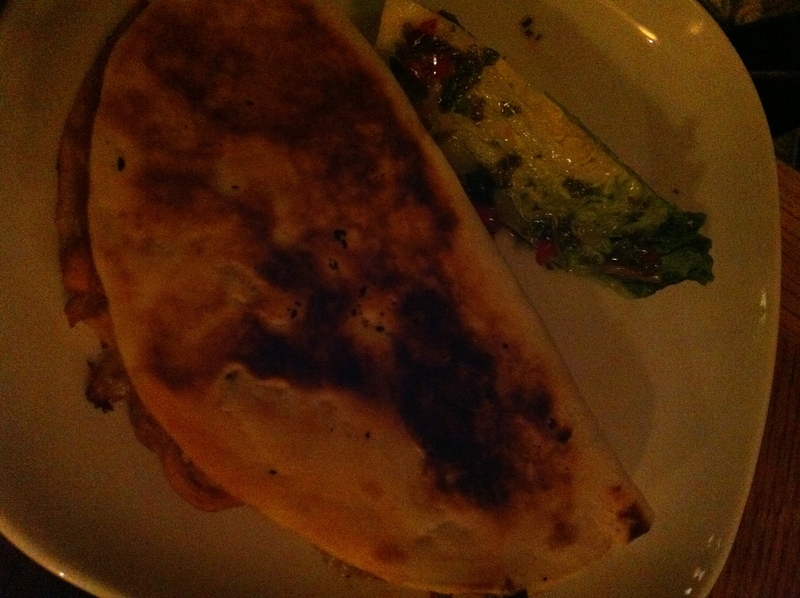 The quesadillas were the best. Ben really enjoyed his main course! He had a big burrito stuffed with fajita veggies, rice, cheese, beans and guacamole which he demolished. The fajita spiced fries and corn on the cob were also a success and he wants to recreate the corn some time soon! They chargrilled it with lime and chilli and he said it was like nothing he’d ever tasted. We were much too full for dessert so paid our bill which came to about £50. Not bad for dinner for two with a drink each although taking into account we got the nachos free and two of my dishes, a little more expensive than we usually would pay. Overall, we will definitely be returning to La Cantina as the atmosphere is really nice and buzzy and the food is good – I’ll just pick a bog-standard main course next time now that I know what I like!